Take a look at our quick start guide for simple setup. Below is the complete documentation for the server. 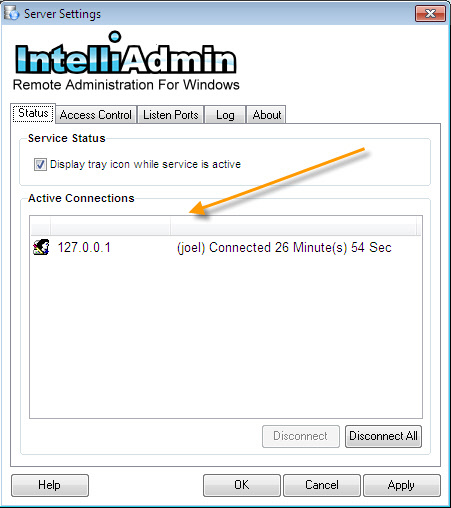 In the server settings application, the main tab shows all of the currently active connections, and allows you to enable or disable the server tray icon. 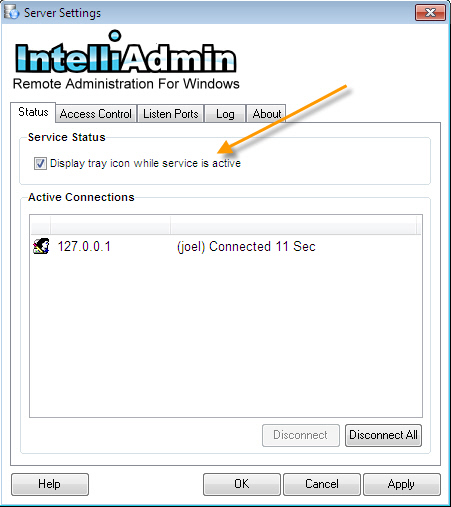 When selected, the server tray icon is displayed while the server is running. When the tray icon is showing, you can click on it to display additional information and launch the settings application. The configure button will load the server settings application. 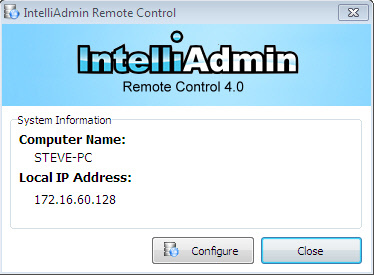 This can be disabled using the group policy inf file, or the remote control distribution tool. Do this by clicking on the appropriate buttons while that user is selected. There are three user types: A Windows user, a standard user, and a VNC User. Standard User – This is an arbitrary username and password that you set. 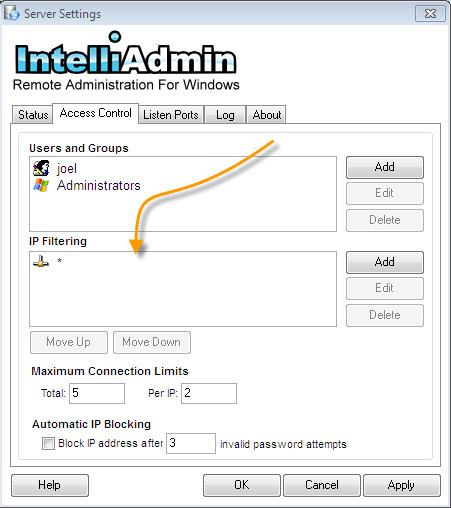 It allows you to create an access account that is not associated with any windows username or group. For standard, and Windows users these settings are used to override the client's preferences. 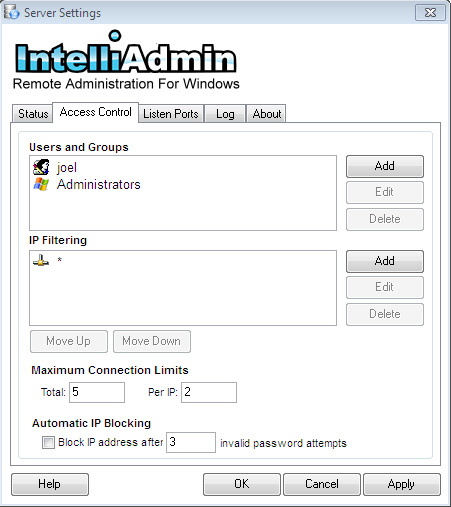 For example, if you wanted windows users in the "Remote Users" group to be forced to always ask permission before connecting, you would add this group and simply check the "Always Request Access Before Connecting" option above. When those users connected, no matter what preference they have in their client, they would be required to ask permission before connecting. 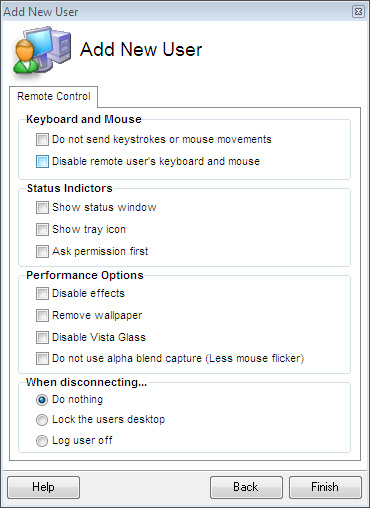 Since VNC Users have no way of requesting these features, this form is used to determine the default behavior when they connect. The rules are processed in order of how they are displayed in the settings window. If no Block or Allow match is found the Server assumes it must block the connection. Once a match is found, the Server takes the action requested (Block or Allow) and does not look any further. The rules use simple wildcards like * and ?. A * represents any number of characters, and a ? represents a single character. If a rule is out of order, you can use the "Move Up" and "Move Down" buttons to position it properly. This implicitly blocks all other IP addresses because if there are no matches for an address, the Server will block the connection. 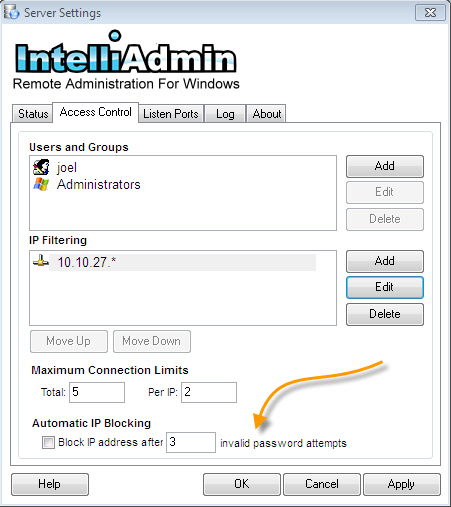 The Server can automatically block an IP address if a user attempts to connect, and sends the incorrect password too many times. When a user is blocked automatically the IP address is not added to the standard filter list. The blocked IP is added to an internal list, and is erased when the service is restarted, or 15 minutes has passed since the last invalid attempt. The Server can listen on multiple ports, and different interfaces. 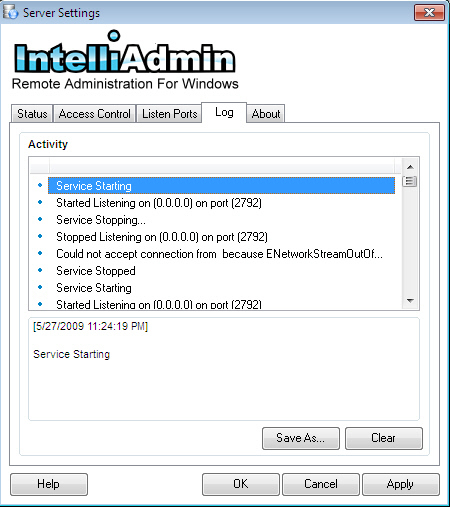 By default the Server will listen on port 2792, and port 5900. 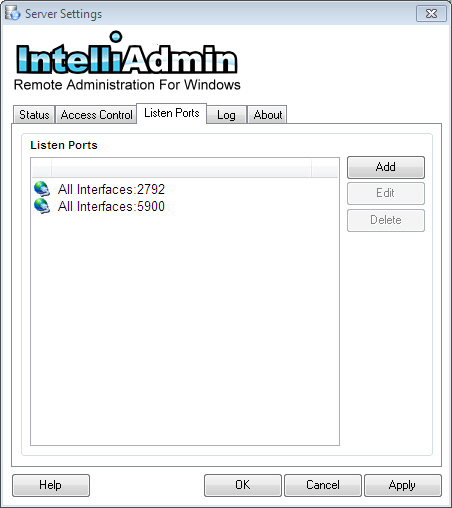 Add port 2792 if IntelliAdmin clients are connecting, and 5900 if VNC clients are connecting to the Server. 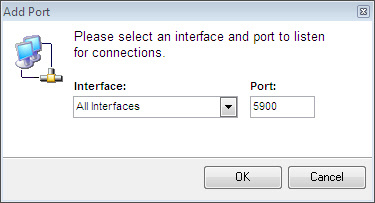 After you add the interface, the server will only accept connections from clients that are on the internal network. The server can be installed silently. 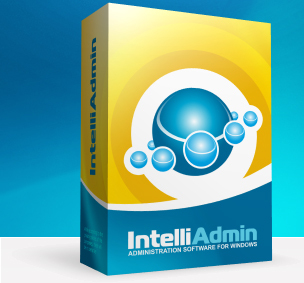 -The Windows Administrators group will be added as a remote control administrator. -The server will be setup to display the tray icon while it is active. Note that the quotes are only needed around the user or group if they have a space in the name.